A bluebird perches on a metal railing at the community gardens near St. Luke's cemetery and watches for insects. When it spots one, it will swoop down and catch it near the ground. Male bluebirds are brilliant blue in the breeding season with a rusty breast and white belly. Females are duller blue. Everybody loves a bluebird. We see them in Westborough – year-round in years with mild winters – thanks to national and local conservation efforts over the past several decades. Our native Eastern bluebirds (Sialia sialis) are a conservation success story. They had declined in the eastern U.S. by the mid-1900s due to the two chief causes of decline for native plants and animals: habitat loss and competition from non-native species, in this case non-native birds. Pesticides, including DDT in the 1950s and 1960s, may have contributed to the bluebirds' decline as well. What kind of habitat loss impacted the bluebirds? Bluebirds live in open, grassy areas such as fields, where insects abound, with scattered trees or other objects, where they perch while watching for insects. They have long been associated with people, especially on farms, which have the kind of landscape bluebirds need - fields with occasional trees and lots of fence posts for perching. 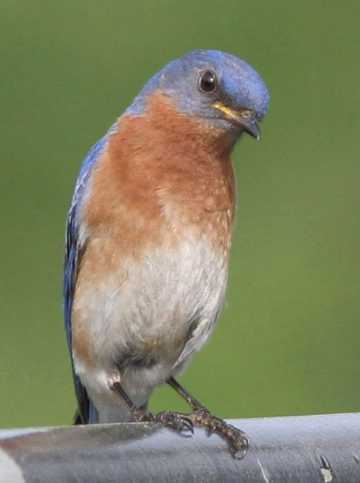 As farming declined in the eastern US, including Westborough, throughout the 1900s and farmlands were abandoned or turned over to development, the bluebirds' habitat shrank dramatically. What about competition? House sparrows (Passer domesticus), also known as English sparrows, were introduced from Europe in 1851, and European starlings (Sturnus vulgaris) were introduced in 1890. These newcomers share the bluebirds' need a very particular bit of habitat. Bluebirds need holes for nesting, typically in dead trees and old wooden fence posts. They can't dig their own holes in rotting wood because their beaks aren't strong enough, so they rely on existing holes. The introduced house sparrows and starlings prospered and multiplied. They also proved to be far more aggressive than the native bluebirds in taking possession of nest holes and defending them. House sparrows sometimes even peck nesting bluebirds and their eggs or chicks to death. At the same time, the supply of nest holes continued to dwindle. The loss of farms and fields, the use of metal and other materials besides wood for fence posts, and the practice of removing dead trees and branches from property all work to keep nest holes in short supply. This was bad news for bluebirds. Conservation efforts came to the rescue, starting as long ago as the 1920s. These efforts increase the supply of nest holes with nest boxes that are specially designed and carefully placed to meet the needs of bluebirds. For example, if the hole in a bluebird box is only 1-1/2 inches, it is big enough for bluebirds but too small for starlings. If bluebird boxes are placed far enough away from houses, barns, garages, other buildings, and trees, house sparrows are less likely to find them. Thanks to bluebird boxes and the dedicated individuals who put them up and monitor them, bluebirds are making a comeback. They were a rare sight in the 1960s and 1970s, but their populations have been growing since then. Where can you see bluebirds in Westborough? Look in the kinds of grassy, open areas that they like. Farmlands, pastures, fields, golf courses, cemeteries, large lawns, and powerline cuts are likely places. You won't find them in the woods. Westborough also has nest boxes. You can watch for activity at these boxes, but be careful not to get too close or to disturb them. The Sudbury Valley Trustees Walkup and Robinson Memorial Reservation has several nest boxes in a lovely field, complete with a bench and rocks at the edge of the field so you can sit and watch comfortably. Boxes are also located on fence posts at the community gardens next to St. Luke's cemetery. The Westborough Senior Center has its own nest box, and so do the fields at Hastings School. May is a good time to look for bluebirds. Many pairs have already nested once and may do so again, sometimes in the same box or natural hole. The parents continue to feed and protect their offspring for up to a month after they leave the nest, as the young bluebirds learn to feed themselves and becomes good at flying. When the parents nest again, the young birds from the previous brood sometimes remain in the area and help the parents feed the new young. Bluebirds do migrate south, but they sometimes stay in their old territory if the winter is mild. They switch from insects to berries once the weather gets cold. To stay warm, groups of bluebirds sometimes huddle together in a hole. Also, more information about bluebirds in Westborough is coming soon to the WCLT web site.